Tired of carrying your bag around the course? Let us help. 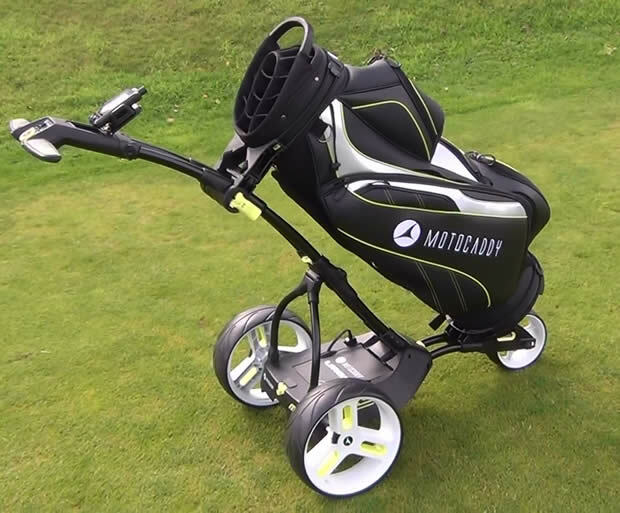 Thanks to our friends at Motocaddy, we are giving you the chance to win a brand-new Motodcaddy M3 Pro electric trolley with 36-hole lithium battery and Pro-Series bag, worth around £650. The new M3 Pro design is 40% smaller than the company's S-Series trolleys and can be folded down to a size not much bigger than an airline hand luggage allowance! As well as an extremely compact-folding design, the M3 PRO also provides golfers with a host of features seen on the brand’s popular S3 PRO model. These include a five-minute ‘lost ball’ timer, ‘round’ timer, clock and battery meter, plus a full-colour digital screen with multiple distance readings. Congratulations to Amy Duncan, who correctly told us that the Motocaddy M3 Pro can be sent up to "60 yards" ahead, using its Advanced Distance Control (ADC) technology. The competition is open to UK residents, except employees of Golfalot, Motocaddy and their families and agents. Prizes are non-transferable, there is no cash alternative. The first randomly drawn correct entry will win the prize indicated. The winner will be notified by email to the email address included on the winner's entry form. Lost and delayed entries will not be accepted. No responsibility is accepted for lost or delayed entries. Only one entry per person permitted. Any breach of these rules will result in the entry being declared null and void. Golfalot may share your details with Motocaddy, who may contact you about other similar products which they think you may be interested in, but will not pass this information on to another third party. The closing date for entries is 30 June 2014. One entry per person.